Actor-director Divya Khosla Kumar recently walked as a showstopper for RAR Studio by Ritesh Aniket & Rishav at the Bombay Times Fashion Week held in Mumbai. Divya Khosla Kumar wore a black traditional suit where she looked effortlessly gorgeous in a subtle makeup with a winged eyeliner. The filmmaker accessorized her look with a heavy choker and summed it up with a side braid with few hair strands left out. 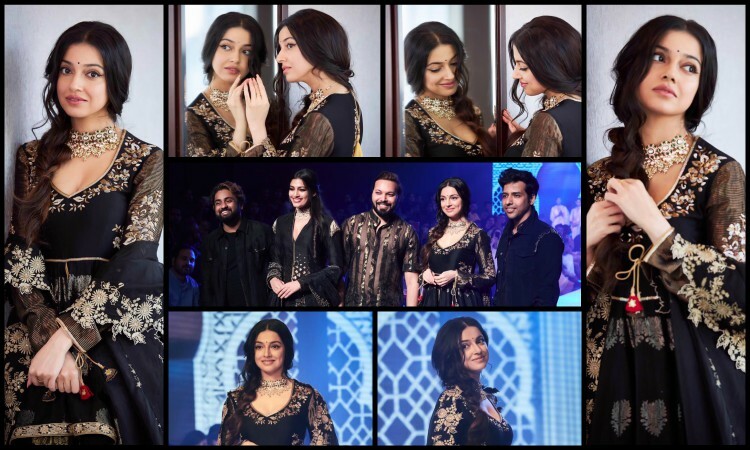 Sharing the moment Divya Khosla Kumar took to her official Twitter handle and shared, "Showstopper Diaries at the #bombaytimesfashionweek for @RarstudioO beautiful Sangemarmar Collection @bombaytimes @TimesFashionWk #divyakhoslakumar #blacklehenga #handloom #chanderihandloom". Earlier too, Divya Khosla Kumar has walked for multiple times as a showstopper looking every bit stunning in all the shows. Previously Divya Khosla Kumar had walked for top designers like Neeta Lulla, Pria Kataria Puri, Rina Dhaka, Parvathi Dasari before this. Now in 2019 also Divya Khosla Kumar goes unstoppable and created her magic at the Bombay Times Fashion Week with her elegant black traditional outfit. Tara Sutaria and Ahan Shetty to be PAIRED for Sajid Nadiadwala's next! Vicky Kaushal's most embarrassing moment at Shah Rukh's Diwali Bash!